I ordered 3 of these to fit in a space that used to be the base of a large console TV. The ottomans look great, plus I am able to use the storage space for my grandchildren's toys. We use the ottomans for extra seating in our home. 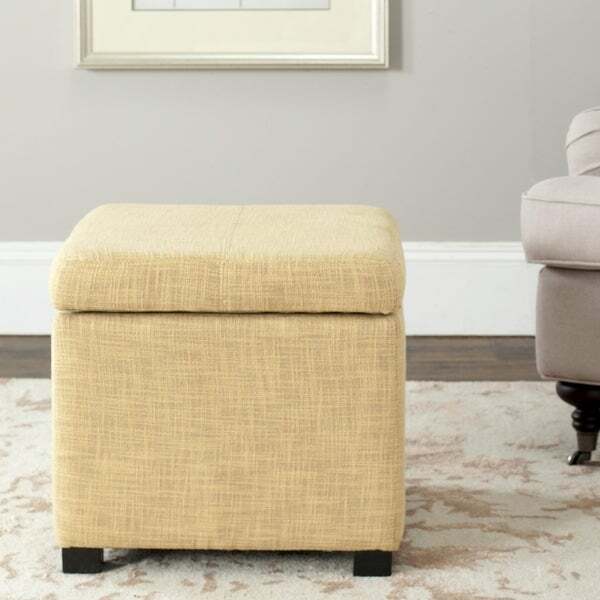 This Broadway storage ottoman features a contemporary style and functional design with a flip top for easy access. Constructed with a sturdy wood frame and a viscose blend upholstery in a light gold. The additional storage space will be a welcome in any room. Dimensions 17 in. H. x 18 in. W. x 18 in D.
This ottoman was exactly what I was looking for to put in my master bedroom closet. It is not too large, and the top is hinged. You can't tell from the photo, but the hinges are high-quality metal hinges that hold the top open. The top is padded and upholstered nicely. My only complaint is that it is a little brighter gold than in the photo, but it is a nice color. I needed something for my apartment bathroom to store extra towels and such. I also needed a vanity type seat for applying make-up and doing my hair. This is the perfect size and it is as stylish as can be. I did add a pillow to the seat to add more color and give my tush a little extra padding. I thought I might need wheels added so it could move easier since I don't have much strength to pick things up. But it already had glider-type attachments so the ottoman moves easily on my tile floor. I looked around in stores and online at many options, and I am so glad I chose this product. These are beautiful! I put them in front of my fireplace. I am so loving Overstock. Arrived promptly and in great condition. Thank you Overstock! "Is the top cushioned to provide extra occasional seating? is there a weight limit for seating?" Hello renotime, we do not currently weight test items. We apologize for any inconvenience. Thank you for shopping with us. "What is the interior storage dimension?" Hello dot123, the interior dimensions are approximately 10.2" H x 14.6" W x 14.6" D. Thanks for shopping with us! A.S.